Can We Predict Your Sentiments by Listening to Your Peers? Web sources of tourism services provide valuable resources of knowledge not only for the travellers but also for the companies. Tourism operators are increasingly aware that user related data should be regarded as an important asset. 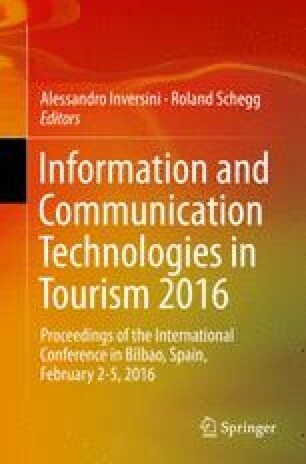 In this paper, user activities and interactions in the tourism domain are analysed. In particular, the emotions of the users regarding their forthcoming trips are studied with the objective to characterize interdependencies between them. Social network analysis is applied to characterize the interactions between the users. To capture their emotions, text mining techniques and sentiment analysis are applied to construct a measure, which is based on free-text comments in a travel forum. The experimental outcome provides some evidence that social influence between the users in the network exists.